Click on the picture to enlarge. Whatever you think of the cover, I hope you'll agree with me that Mr. Manager is one of the more notable African releases of the '80s, one of the first truly "Afropean" albums and a mostly successful attempte to fuse Congolese tradition with European techno music. Zazou Bikaye was a collaboration between French/Algerian composer and arranger Hector Zazou and Congolese vocalist Bony Bikaye. I haven't found out much about Bony Bikaye. Discogs lists two solo albums and an EP but that's pretty much it. Hector Zazou, however, who died in 2008, boasted quite a C.V., with Wikipedia listing 44 citations. He specialized in cross-cultural fusions and mash-ups long before "World Music" was a marketing gimmick, or even a thing. 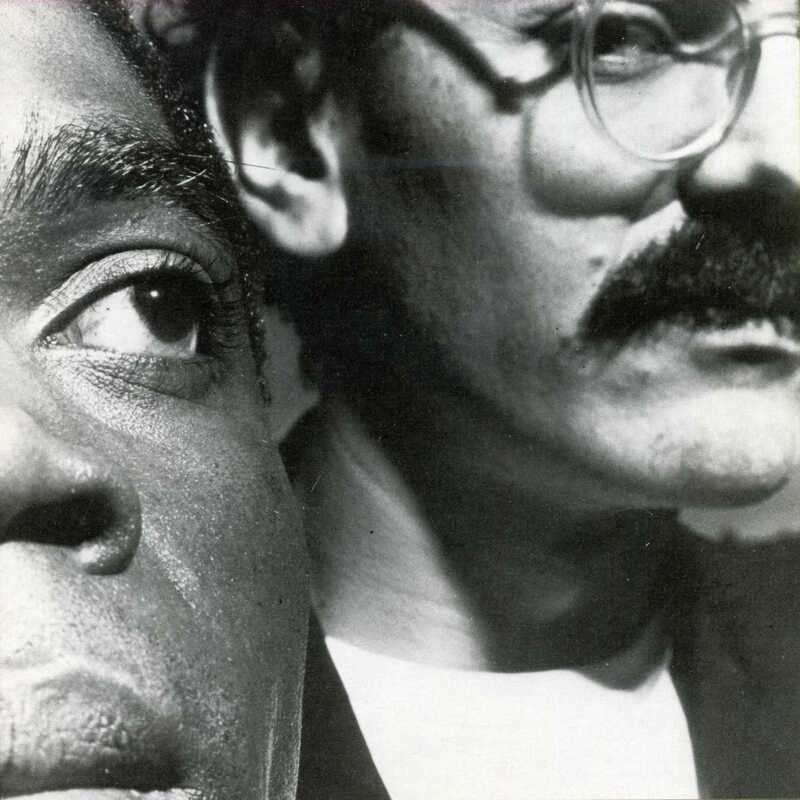 Zazou and Bikaye's first outing, with French synthesizer wizards CY1, was 1983's Noir et Blanc (Crammed Discs CRAM 025), and has been described as "Fela Kuti meets Kraftwerk on the dance floor" and a cult classic. It will be reissued in November, and is available for pre-order here. I dunno. I got Noir et Blanc not too long after it first came out, and I like it, but it's always seemed a little cold and austere for my taste. Maybe it deserves more time than I've been willing to give it. Mr. Manager, on the other hand, strikes a better balance between digital and analog. Two tracks in particular, "Nostalgie" and "Angel," always got a good reception back when I aired them on my old public radio program, "African Beat" in Milwaukee. It's a great album and I hope you'll enjoy it too! Download Mr. Manager as a zipped file, with cover and label art, here. I hope I'm not stepping on any toes by sharing this here. An internet search doesn't turn up any current availability for Mr. Manager through any online stores or streaming services, but if any label or copyright holder objects, let me know through the comments and I will remove these files immediately. I'll be out of town for a week and don't expect to be able to blog, but I wanted to get something in, so this one's a quickie. I never managed to snag Vols. 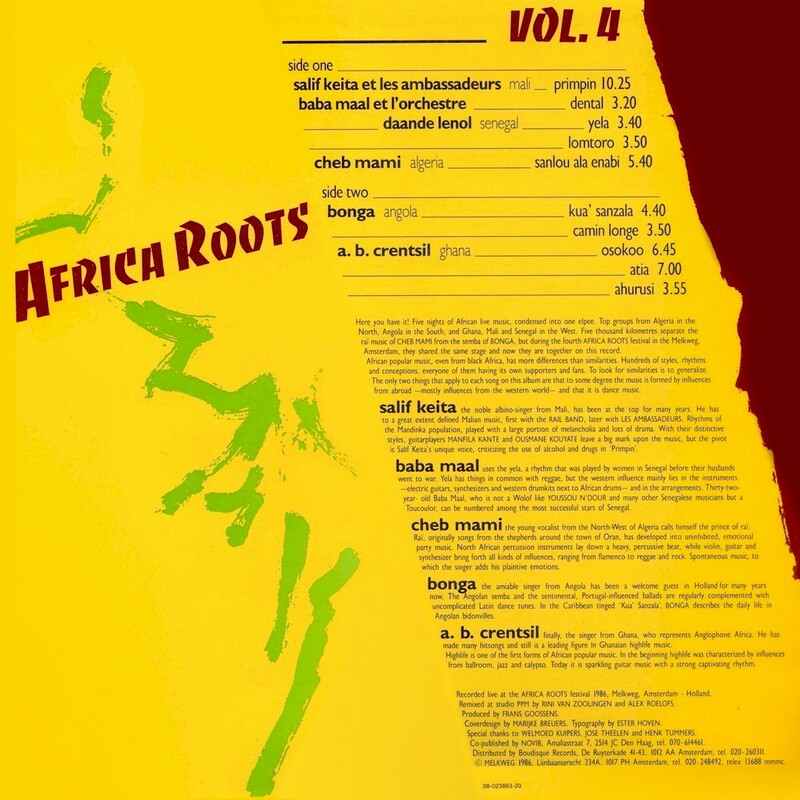 1-3 of the legendary Africa Roots series, recorded at the Melkweg in Amsterdam in the early '80s. I did get hold of the fourth and final (?) installment, and what a wonderful recording it is! Click on the picture below to read about the artists and the songs. The standout here is Mali's legendary Salif Keita along with the equally fabled Kante Manfila and Ousmane Kouyate, who deliver a scorching rendition of the Ambassadeurs classic "Primpin." Senegal's Baaba Maal, Algeria's Cheb Mami, Angola's Bonga and A.B. Crentsil from Ghana don't disappoint either with inspired renditions of some of their greatest songs. It's all good! Listening to these tracks will take some of you back to the exciting days of the '80s when every day brought a new revelation for us African music fans and World Music™ had yet to be conceived. Enjoy!